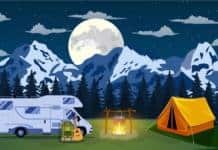 While RV industry cheerleaders are practically wearing themselves out flashing their pom-poms and losing their voices shouting about the huge number of RV sales, a small voice in the investment world is urging a bit of caution. On Thursday, January 25, stock prices for big RV builders Thor and Winnebago took a beating after an investment analysis firm suggested folks with money in RV industry stocks might want to back off and sell a bit. The concern? RV dealers, says Northcoast Research, have too many rigs on their lots, and customers with money to burn may not be beating a path to their local RV dealers’ showrooms. Stock prices for both Winnebago and Thor fell close to 8 percent Thursday. Things weren’t any better when Friday’s closing bell rang: Winnebago was down more than another 8 percent. By Friday, both of the companies’ stocks had fallen below their 50-day moving average. That figure is a stock’s average closing price over the last 50 days, and is an important indicator to investors in predicting what the future of a stock might mean. Like the influenza, the pullback was catching. RV parts and supplies manufacturers also found themselves less attractive to stock market investors. LCI Industries, Lippert Components – one of the major component manufacturers for the RV industry – watched its value dump 7.6 percent. Patrick Industries, which manufactures doors, floors and countertops found in huge numbers of RVs, lost more than 8 percent. Some may say this is like one of Macbeth’s lines: “It is a tale, told by an idiot, full of sound and fury, signifying nothing,” but you can bet there were a lot of sleepless nights out in Indiana as RV manufacturing bosses chewed on the news. It’ll bear watching. Let’s hope something triggers the RV manufacturers to start building quality instead of junk. We know what the future brings when the recall expense throws the manufacturer into bankruptcy. The horror stories are growing. Maybe the German’s arrival in the US market will put the fear in them. No sympathy for Thor,Winnebago or Lippert here.Especially Lippert.BUYER BEWARE,these companies are greedy and after a fast buck with poor quality.It is no longer the RV world of your daddy’s. Stock prices are based on information regarding future profits as they relate to current assets. Corporations just got a huge windfall from the TCJA. When car dealers get shipment on the new model year, they discount the previous years inventory to make room for the new models. When supply exceeds demand prices fall. Apparently they didn’t try to move units. Maybe manufactures could now cut back on the number of units built and build units that are better quality.